Nashville Meets London @ Pizza Express Live. As you exit Holborn underground station you wouldn't think much of the Pizza Express restaurant opposite. As you enter the restaurant and make your way down a spiral staircase it's a whole different feel. A stage takes centre stage, surrounded by tables of fans tucking into their pre concert pizza. This unique venue has become home to the monthly night hosted by Nashville Meets London, an evening of country music featuring one emerging act from across the pond and one from these shores. Tonight it is the turn of American Young and Kate Ellis to perform at this intimate London underground venue. Shortly after 8:30, Baylen Leonard took to the stage to introduce the evening and the opening act, Kate Ellis. With waiters hurrying around the floor, there was no concern of forcing your way to the bar in the cabaret set up. With a set that included tracks from her latest album, Carve Me Out, including Don't Lie to Me, I Believe and The Ones We Love The Most, Ellis also treated the crowd to a track from her next album. Throughout the whole set the crowd hung on every word and story that Kate had to share. During the set, Kate found time to perform a cover of the track Hurt, made famous by Johnny Cash. As the set came to a close the crowd reminisced back to their youth for Paper Scissors Rock, before closing with the track from the 2017 album, Carve Me Out. At this point at a concert you'd expect a rush to the bar to order a pint of beer in a plastic cup, which you would have dropped half of by the time you got back to your space. Not at Pizza Express Live. Instead, the house light return, waiting staff appear on the floor ready to top up wine glasses and armed with dessert menus. As the stage is being set for American Young, the trays of cappuccino begin to appear as the audience needs to make minimal effort to remain comfortable. With glasses topped up and coffees served, the lights would dim as American Young made their way to the stage to open with Be Here. After introducing the band members they had helping them out for the night they performed a cover of country superstar Garth Brooks’ The Thunder Rolls. During the set Kristy confirmed the news that American Young was about to have a younger member with the news of her pregnancy. It may feel ironic that the next song the went for was the life on the road track, Point Of View. 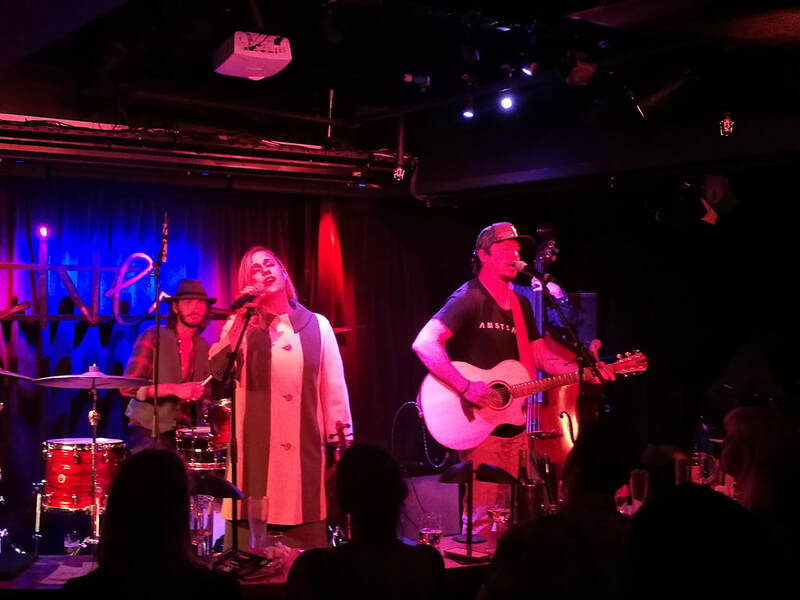 American Young seemed to have enjoyed their latest visit to England, and continued to show their on stage chemistry with Love Is War, where they even snuck in a few lyrics to Cotton Eye Joe to finish the track. It was break up time next as Kirsty questions where a cheating boyfriend met the white trash girl, a song Kirsty just about managed to complete without laughing. After the amusement the set turned to John’s writing back catalogue for a song he wrote for Lee Brice, A Woman Like You. After John's subtle hint for a drink top up on stage it was time for another cover with Just The Two Of Us. American Young then treated the crowd to a new track before asking the crowd to vote on the next track. The powerful track Soldier’s Wife won. More on stage anger ensued between the pair in the build up to Something To You. After comparing tattoos the duo broke out into Slow Ride, which featured an extended instrumental before admitting it was too much like hard work to exit the stage before returning for an encore!! As Kristy started on the violin and John joined with his guitar the crowd clapped along to the introduction of their albums title track American Dream. As many felt that would be the end of the night, American Young had other ideas. It was time for a rendition of Wake Me Up, with a few errors along the way - totally unnoticed by the crowd though guys. It may not be one of the most conventional music venues in London (definitely the first time I've eaten a pizza during a gig) but this unique setting offers the exact vibe that Nashville Meets London is looking for from these intimate shows. 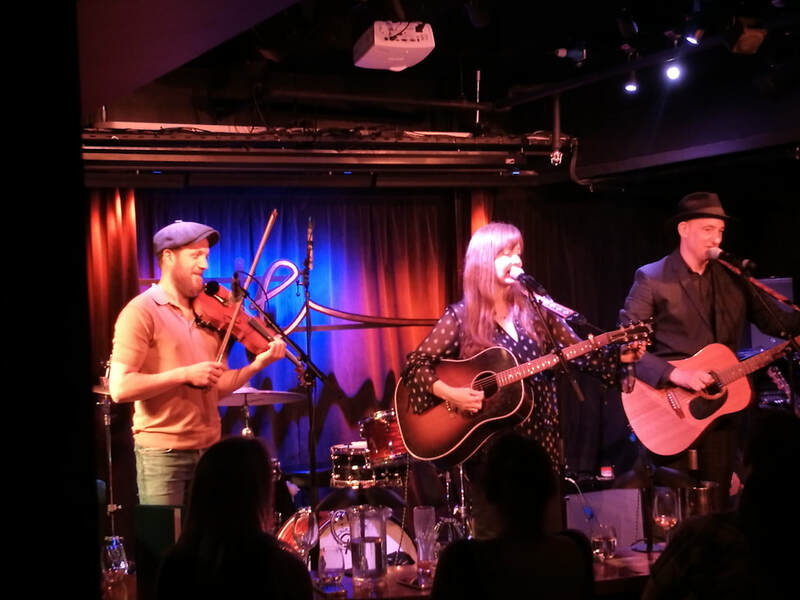 Next month will be a big month for Nashville Meets London, they will return for an evening at Pizza Express before taking over the River Thames ahead of a weekend of free country music at London's Canary Wharf. If you are a fan of American Young make sure you head over to our Country Tribune feature where Kristy shared with us this week advice she would want to give her younger self.